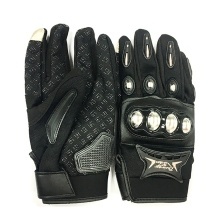 This glove is a professional racing motorbike riding glove, not only comfortable, but also safe, breathable and sweaty, all-weather to protect your safety. Unique breathable design to keep skin fresh. Joint protection design to improve the anti-fall performance of gloves. Fine quality fabric, quick perspiration to ensure comfortable hands. Elastic gloves with edge bands.